Whether you manage commercial or residential spaces, your business should be all about tending to your tenants’ needs, taking care of maintenance, and turning vacancies into new rentals. Let us clean out your property and you’ll have one less thing to worry about! For Commercial Property Managers, we specialize in office, warehouse, and retail store cleanouts. Whether you have just a couple of items or multiple floors of office furniture and cubicle panels to dispose of, you can count on our well trained and professional team to do the job for you. We will issue a Certificate of Insurance for each and every job we do so both you and your client are protected. Please call us for a free no-obligation estimate for your next cleanout project. For Residential Property Managers, we specialize in apartment trash-outs, dumpster clean-outs, and debris left in parking lots. Upstairs, downstairs, inside, or outside we will haul anything you want from your properties. We will issue a Certificate of Insurance for each and every job we do so both you and your client are protected. 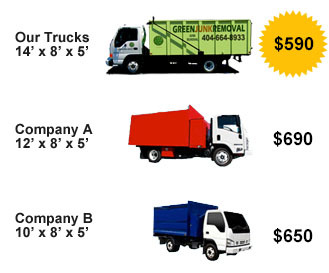 Please call us for a free no-obligation estimate for your next cleanout project. All evictions in Georgia (residential eviction, commercial eviction, renters eviction, landlord tenant eviction, home eviction, apartment eviction, HUD eviction, rental eviction, corporate eviction) involve a 2 day process. Day 1 supervised by the Sheriff’s Department involves removing all items safely from the eviction site to the outside. Day 2 involves dispatching a truck to the eviction site (24 hours later) to haul away any items still left and not claimed by the owner(s). 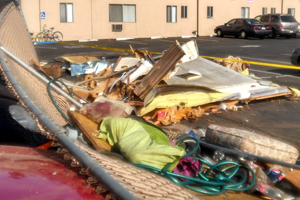 Charges for Day 1 and Day 2 of the eviction process are different and depend on the size of the crew needed for the eviction as well as the amount of “junk” removed. Please contact our office for pricing information specific to your eviction needs and circumstances. When it comes to Georgia foreclosures, each foreclosure process is unique whether it involves a residential home, bank owned homes, repo homes, HUD foreclosure homes, government foreclosure, REO properties, county foreclosure, business foreclosure, office building foreclosure, and commercial foreclosures. 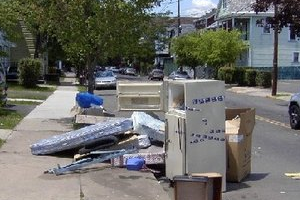 Although we charge based on the truck loads of junk and debris removed from the foreclosed property, the type of the “junk” as well as the labor involved determine the final price. Please contact our office for pricing information specific to your foreclosure case.